All prices quoted are in Australian Dollars. We can ship our products anywhere in Australia or Worldwide. All headers can also be supplied with high temperature JET-HOT Coating (at an additional cost - prices here). We can custom manufacture headers or complete exhaust systems for almost any application. If you need an exhaust component not listed or have any questions please phone or Email us. Click on any underlined item to see a photograph of the product. Please use your back button to return to this page. Note: Engine Conversion Headers - CAE recommends you use our engine mount and cross members as we can not guarantee correct fitment if you use other brands. Due to the large range of conversion & aftermarket components available, eg. 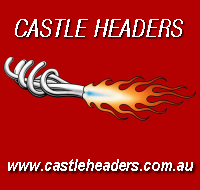 Cylinder Heads, Engine Mounts, Transmission Crossmembers, Steering Components & Combinations, Sumps, Starter Motors etc., Castle Headers CAN NOT GUARANTEE our Headers will fit with every combination available. Made in Australia by Australians.